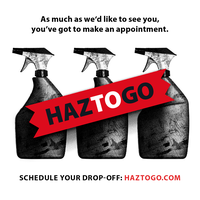 HazToGo Lincoln's Hazardous Waste Center, is located at 5101 N 48th Street. Lincoln's Hazardous Waste Center serves both Lincoln and Lancaster County as your safe, environmentally responsible and convenient drop-off location for toxic chemicals and hazardous waste. Best of all, it's FREE for residents. And some small businesses may qualify for a reduced cost for hazardous waste disposal. Please note: This page does not support Internet Explorer. Please use Microsoft Edge, Safari or Google Chrome browsers.